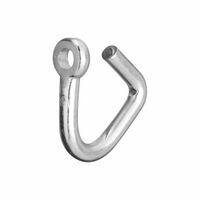 Ben-Mor Chain, Series: 54000, NO 6 Chain, 130 ft Length, 50 lb Load Capacity, 0.23 in Material Diameter, 1 in Inner Length, 0.3 in Inner Width, Plastic, White Forged carbon steel for maximum strength. Spring steel snap rings. Zinc plated to resist rust. Forged carbon steel for maximum strength. Spring steel snap rings. Zinc plated to resist rust. Forged carbon steel for maximum strength. Spring steel snap rings. Zinc plated to resist rust. Forged carbon steel for maximum strength. Spring steel snap rings. Zinc plated to resist rust. Low carbon steel. A general utility chain for farm, industry and home applications. Hot-dip galvanized. Grade 30. Chain comes in a bucket. 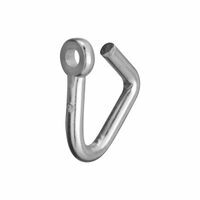 National Hardware Cold Shut, Series: 3153BC, 1/4 in, 0.24 in Rod Diameter, 0.26 in Hole Diameter, Steel, Zinc Plated, 1250 lb Load Capacity, 1.61 in Width, For Use to Couple Chain Attachments Forged carbon steel for maximum strength. Spring steel snap rings. Zinc plated to resist rust.